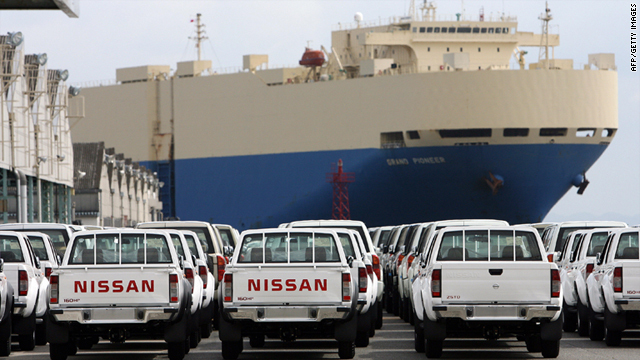 Nissan Motors' pickup trucks line up for export to the Middle East area as a freighter approaches to the Nissan pier at the Yokohama port, Kanagawa prefecture, 15 September 2006. A company official says the measures aim to "reassure the public"
Tokyo (CNN) -- Nissan has started scanning vehicles made in Japan for traces of radioactive material, a company official said Friday. "Looking ahead, we will continue to implement all appropriate measures to reassure the public that all products from our company remain within globally accepted safety standards and until we are confident that any risk of contamination is completely removed," said Simon Sproule, corporate vice president of marketing for Nissan Motor Company. Sproule said the monitoring began this week. Sources inside the company said there is virtually no risk of contamination from a car and no potential health risk to customers, but testing began because of public concern. Production at several Nissan facilities remains suspended after a 9.0-magnitude earthquake damaged plants and equipment on March 11, the company said in a statement Thursday.